Ebano AP is a rare Smokey Black APTO approved Andalusian stallion. He is bred and branded by the outstanding Peralta stud. Ebano is pure Peralta which is one of the oldest and most admired studs in Spain. They are one of the few studs who are able to call themselves Carthusian. 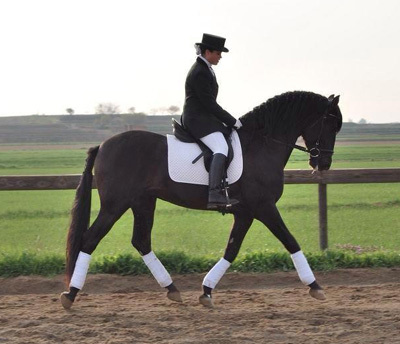 His sire Primavera XXVI is a well known and much admired stallion who has gained the acolade of being registered in the Pura Razo Espanola Book of Merits. He was imported to the UK in 2012 and owned and trained by the Dubia Royal Family. Broomfield Andalusian Stud were delighted to purchase him in 2014 as their foundation stallion and competition dressage horse. 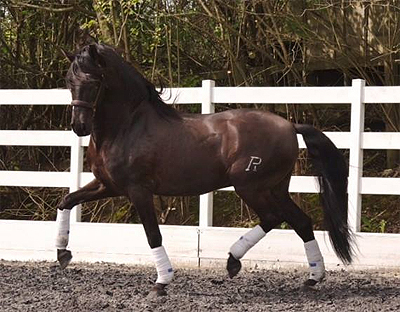 Ebano's movement is light, floating and expressive and he has now restarted his dressage training at Ezperanza Dressage and will be competing throughout the summer. Everyone who meets him is impressed by his fabulous nature and bidable temperament, he is easy to do in all ways. 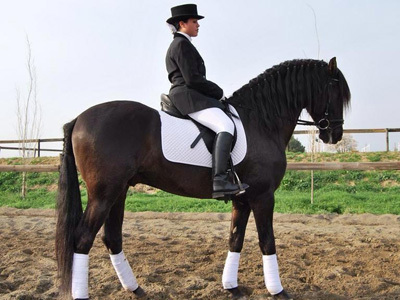 He is an experienced and popular stud stallion and has sired 58 foals in Spain. He stands at 15.3 hh and has the cream gene with the genetic colour code ( EE aa Crr). This means that depending on the mare his is put to he can sire smokey black, buckskin, grullo or black.